It's been called the illegitimate love-child of Lara Croft and Indiana Jones, and compared to both the conspiracy of Dan Brown and the authenticity of Clive Cussler. That's a lot of promise to live up to, but I'm anxious to give it a read. I got turned down for the UK ARC due to territorial restrictions (which is how I discovered it), but it looks like the US date may actually be a week earlier. Woah! I've not seen this book before, but I am definitely intrigued! It sounds awesome. I hope you enjoy this book when you get the chance to read it! Ooh that's a new to me one! Sounds awesome! I hadn't looked at this one before, definitely sounds good! You had me at archaeology! The "illegitimate love-child of Lara Croft and Indiana Jones" blurb doesn't hurt either! Must check this one out. 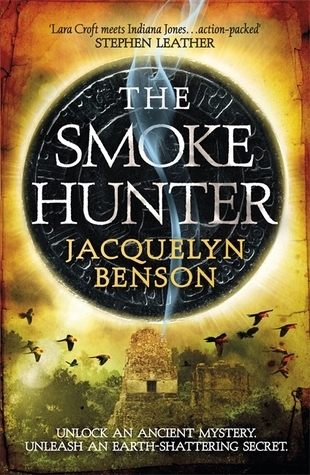 I read The Smoke Hunter and to me, it's less like the love child of Croft and Jones and more like "What if a female author of the nineteenth century wrote adventure novels set in South America in the style of H. Rider Haggard, with a little Romancing the Stone thrown in for good measure?" I understand why publicists would compare it immediately to Indiana Jones, but to me, it was trying to do something a little different.